If you are looking to get lean and increase performance, the benefits of L-Carnitine can help. Widely used by athletes and bodybuilders L-Carnitine is one of the most well known and researched supplements for fat loss and energy production. As an amino acid L-Carnitine is one of the building blocks of protein that helps to maintain a healthy active body. Here’s a brief run down on how the benefits of L-Carnitine can help to accelerate your training results. Supplementing with L-Carnitine may help to stimulate your fat burning metabolism and lose fat at a faster rate. L-Carnitine’s primary role is to convert long chain fatty acids into mitochondria where they may be oxidised to produce energy. By raising the level of L-Carnitine in your muscles you can support the fat burning process by making your body more efficient at processing fuel. As your body becomes more efficient, L-Carnitine helps to reduce fat mass, increase muscle mass and reduce fatigue that may all contribute to weight loss results. Clinical studies showed that supplementing with carnitine increases the amount of fat burned, particularly during exercise. Along with diet and exercise, supplementing with L-Carnitine helped to lose more fat, than was lost from just diet and exercise alone. L-Carnitine is included in many fat burning protein powders including Vitalstrength Hydroxy Ripped and is available in powder or capsule form. 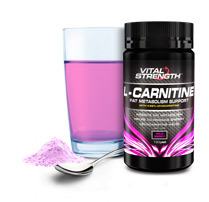 Try Vitalstrength’s new L-Carnitine powder in delicious wild berry flavour. Research has shown that both endurance and strength athletes can benefit from L-Carnitine supplementation. Athletic benefits include increased endurance, stamina and energy, improved oxygen uptake, reduced lactate levels during exercise and improved anaerobic strength output. More recently L-Carnitine has also been found to have anabolic, muscle building benefits. L-Carnitine may increase blood flow to your muscles, enhance muscle recovery post-workout and increase the amount of testosterone receptors inside muscle cells, helping to stimulate muscle growth. The acetyl component of Acetyl L-Carnitine is present throughout our bodies, especially the central nervous system making it more bioavailable to the brain. As it is more able to cross the blood-brain barrier Acetyl L-Carnitine may help to maintain healthy brain function. Research suggests Acetyl L-Carnitine supplementation may enhance brain function and protect it against deterioration as you age. So if you want to burn more fat, lose weight, enhance brain function or increase athletic endurance and performance start taking an L-Carnitine supplement today.